Our 34th President, Dwight D. Eisenhower faced this same dilemma when he was elected to the highest office in the US. He realized the need to focus on the right things if he was going to do the proper job of governing our country. Eisenhower developed his own matrix to ensure he was properly investing his time to focus on the most important actions for governing the most influential power in the world. Often credited to Stephen Covey and his Seven Habits of Highly Effective People, the real credit for this productivity matrix originated with Eisenhower. When explaining the matrix to a customer this week during the Execution phase of our Two Day Introduction to the Rockefeller Habits, he reminded us of one of the most lasting and beneficial decisions Eisenhower made during his administration: The Federal Aid Highway Act of 1956. Eisenhower shared his “Grand Plan for upgrading America’s highways two years earlier, but his vision for this dramatic idea came in 1919. As a lieutenant colonel in the Army he engaged in a grueling cross country military convoy. The poor conditions of America's roads made the trip exhausting and more burdensome than it should have been. If you look at the matrix where would this decision be? It’s certainly not in the first quadrant as urgent. Yet if Eisenhower had not made this a priority many of us would not be able to enjoy the freedom and efficiency that cross country travel provides today. Where do you spend your time each day? In many cases most of us spend the bulk of our time in the first column handling urgent activities, regardless of their importance. Someone interrupts you and suddenly your entire focus is consumed with handling their issue. Regardless of its importance we rescue that person. Helping someone make a decision or solve a problem makes us feel important. Yet in many cases are response enables them, and only guarantees that we will continue to be interrupted with these repetitive issues since now they are dependent upon you for their decision-making. We’ve discussed this issue earlier in The Problem with being the Chief Problem Solver. Giving your people answers is not your role as a leader. As Michael Gerber offered in the E-Myth and the book Multipliers provides as the difference between multipliers and diminishers, your job is to be the person who asks the right questions. These usually include crisis, problems, and or deadlines. You better deal with these and deal with them now or they will damage your business, personal relationships or worse. This is the Federal Aid Highway Act that Eisenhower made a priority. These are often the strategic aspects of your business neglected by the whirlwind of day-to-day activities. You can neglect them, but they will eventually bite you in the future. By the way that vacation you’ve been meaning to take is important and rarely urgent (although if you’re not being productive it may be because you’re overworked and then a vacation could be urgent!). If you haven’t taken a vacation in a long time perhaps it’s because you never invest time in this quadrant. This is often the interruption cycle that we routinely respond to out of habit and feeling important. It could be a meeting you could avoid or quite possibly checking your email too frequently. (You wouldn’t want to miss that important spam about losing weight would you?) 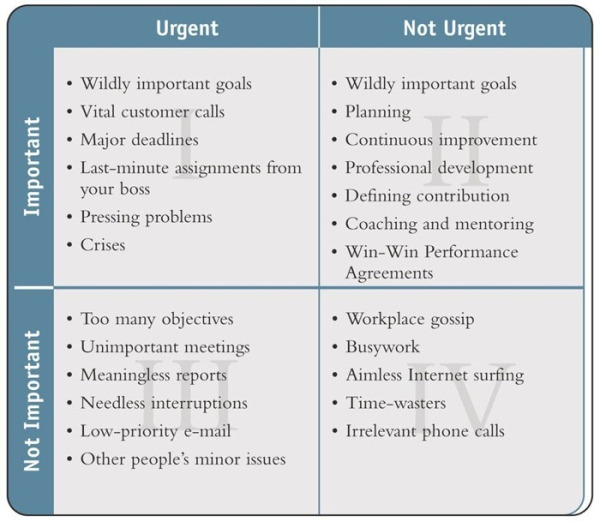 This quadrant is a trap that often makes you feel important, yet rarely contributes much to your productivity. Here’s another trap. You’re researching something and when you get there an ad or a distraction causes you to go down a rabbit hole and not come out for 15 minutes. A phone call interrupts you that you should avoid even taking. You get up to get a cup of coffee and suddenly get into a longer than necessary conversation about the ball game last night or the weather. Some keys to being more effective in following the Eisenhower Matrix have been discussed earlier in Priorities Discipline Requires Precision and Specificity. Quick highlights include, selecting your top six priorities for the day just before you finish each day, scheduling the first hour of the day to work on your #1 priority, specifying the exact time you will work on each of your top priorities. Precision and specificity are routines that inspire and ensure you are most productive. Next time you find yourself wasting time or failing to achieve your top priority, remember the Eisenhower Matrix. And yes there is an APP for that! Download the Eisenhower App here. Customer loyalty is a leading competitive advantage for many companies. We’ve explored measuring customer loyalty before with the Net Promoter Score. We group customer and employee feedback as an important agenda item in our weekly meetings. Now there’s a similar application for Employee Loyalty. We’ll explore that next blog.